If you can tie your necktie without looking, or have accidentally told your boss “I love you” before hanging up the phone, you can thank your habits. Habits are what we do without thinking, and according to Charles Duhigg, author of The Power of Habit, every habit starts with a psychological pattern called a “habit loop,” a three part process in which we train our brains to automatically respond to situations. Not to be confused with addictions, which are harmful and include such activities as nail biting, chronic laziness, or alcohol abuse, good habits can enrich our lives by eliminating stress and automating a laundry list of daily tasks. The three step process is simple. The first step involves a cue or a trigger, which tells your brain it’s time to automate what you’re doing. Second is engaging in your behavior. 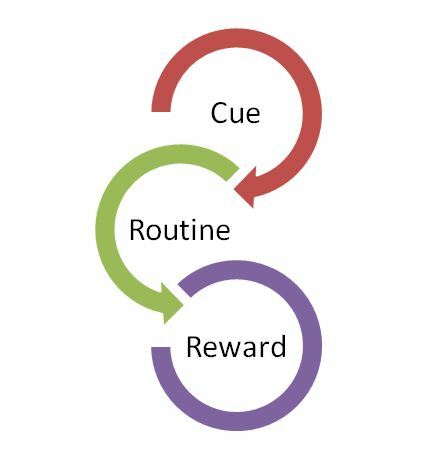 This, according to Duhigg, is “what we think about when we think about habits.” Finally, the reward, the little shot of happiness that helps your brain remember to engage the “habit loop” the next time. So what on Earth do the psychological principles of habits have to do with Jesus, the Church, or being Christian? Well, it could mean a lot. Remember habits can help automate our lives. That doesn’t mean that those actions are less meaningful, that we are no longer emotionally involved, or that slowing down to focus on what we’re doing, (such as inadvertently expressing unwanted affection to our bosses over the telephone,) isn’t a good thing. It is. But sometimes developing a positive, meaningful habit, finding a groove, so to speak, can help you mature spiritually, which is my challenge to you (and myself) throughout the next month. We’re at the doorstep of November, the month of Thanksgiving. Typically we associate Thanksgiving with turkey, pumpkin pies, football, and Black Friday (or anti-Thanksgiving, for the more cynical.) Historically, the idea of thanksgiving is related to thanking God, and goes much further back than the Puritans. Without straying too far from the trail, the word Eucharist comes from the Greek word eukharistia, meaning thankfulness, or giving thanks. Variations of that word can be found in the Didache, a first century instructional book on worship, which offers guidelines for giving thanks to God. That might sound unusual, but I suppose sometimes we need a little guidance when it comes to being thankful. Western culture tends to appreciate or reward taking and acquiring as opposed to giving, so to develop a lifestyle governed by thankfulness might not come natural. So since we have a general idea of how to form a habit, (old wives everywhere suggest that it takes around twenty one to twenty five days,) our next step is to choose a goal. Here’s where it gets tricky. Spiritual maturity is different for each of us; it’s personal. Maybe your prayer life is rubbish and you only talk to God in hopes that He would synchronize the fifteen stop lights you encounter on your way to work. Or perhaps the only scripture you read is projected onto a screen on Sunday. Or the only time you think about someone else’s well-being is when someone else is watching. Or it could be something completely different. What if over the next thirty days you chose one spiritual discipline, praying, reading, loving, living a thankful life to God and those around you, what if each day you set aside a few moments to develop in yourself a rewarding habit that is both thankful and honorable to God? This is my challenge to you; this is your cue. Are you up to it?